Hex Phase EP Released! published on March 31, 2015 Read more posts by the author of Hex Phase EP Released!, Drugs & Wires1 Comment on Hex Phase EP Released! Composer Neon Shudder has been a long-time fixture in Dan and Lin’s messed-up world, having contributed backing tracks to both the second and third installments of Dreamspace. 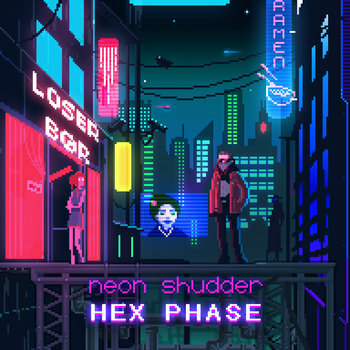 His latest EP, Hex Phase, is now available for streaming and pay-what-you-want download on Bandcamp, and features some pixel-tastic cover art from our very own Cryoclaire! If you’re in the mood for some old-school, synth-driven ambience with a distinct cyberpunk flavor, definitely give Hex Phase a spin. Meet Cryoclaire at the MCM London Comic Con! Meet Cryoclaire at the MCM London Comic Con! published on March 26, 2015 Read more posts by the author of Meet Cryoclaire at the MCM London Comic Con!, Drugs & WiresNo Comments on Meet Cryoclaire at the MCM London Comic Con! The artier half of the Drugs & Wires creative team is returning to MCM London Comic Con, the UK’s #1 pop culture event, from May 22nd to 24th. Swing by her table at the Comic Village for sketches, D&W/Dreamspace merch, and possibly even lucid conversation!